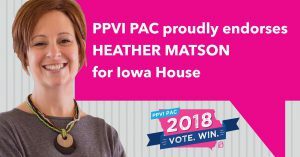 I am thrilled to have the support of Planned Parenthood Voters of Iowa! All health care decisions are intensely personal and Iowa women deserve to be able to make those decisions with their doctors, not politicians. I am proud to stand with Planned Parenthood as they provide high quality, compassionate, and judgement-free reproductive health care services to all Iowans, no matter what. Thank you PPVI for your support!